BulbAmerica, the leading wholesale retailer of quality lighting fixtures and light bulbs recently launched a new range of LED PAR cans that offer the additional benefits of using LED technology. 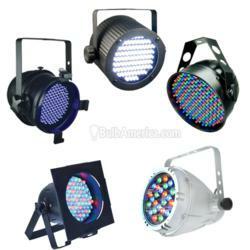 Possibly one of the most common pieces of equipment for stage lighting used by theatre techs and stage lighting designers traditionally, today these LED PAR cans are also being used in retail outlets, band, live music events, and bar lighting and they have become popular lighting solutions for displays. These LED PAR cans are offered in a range of beam spreads (spot, flood, and standard) and they are available in a range of sizes that make them suitable for most applications. Right from PAR 64 cans to PAR 38 cans to pin spots and more, BulbAmerica has an exhaustive inventory of these LED PARs that are also invaluable to architectural and outdoor lighting. LED PAR cans have a long service life, consumer less power, and they are not as expensive as color gel or replacement lamps. As they don’t have filaments, they are also extremely weatherproof, indestructible, and durable. Additionally, some of them that are available in IP65 (and higher) are highly useful as outdoor and architectural washes. BulbAmerica is the largest wholesale provider of quality lighting fixtures and light bulbs in the United States. They have been a part of the industry for almost a decade now and are renowned for offering quality products that include fluorescent, halogen light, LED, CFL, and incandescent bulbs, projector lamps, and various LED lighting options including LED strips. For more information about the light bulbs that they offer at BulbAmerica, visit http://www.bulbamerica.com or call 1-877-650-0775.